I will be delivering a session on “Kinect for Windows SDK” and will talk about how we can build a gesture enabled, and speech recognized application; this is what we called developing Natural User Interface (NUI) application. I will also walk you through with different features of Kinect SDK such as capturing Infrared data Stream, Getting Sensor Accelerometer data, tracking human body joints and something around Face Tracking. Overall, this is going to be entertaining full session with lots of learning. 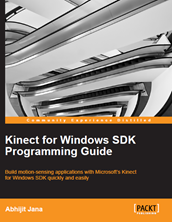 I will give away a couple of E-copy of my Kinect for Windows SDK Programming Guide book.